Recently, associate research fellow Dr. Jianfei Tang from Xinjiang Astronomical Observatory(XAO)made a new progress in the study of effects of the fast electron beams (FEB) evolution on electron-cyclotron maser (ECM) emission, the work has been published in the <Astrophysical Journal>（2016,823,8）. FEBs are common products in various active phenomena in space and cosmic plasmas. For the Sun, particle acceleration is most prominent in flares and coronal shock wave. FEBs reveal themselves not only in hard X-rays and γ-ray emission, but also in radio emission, the key question is how FEBs produce solar radio bursts, ECM emission are one of the most important mechanisms for producing solar radio bursts by FEBs. FEBs propagating downward deeper into the solar atmosphere will lose some of their energy, thereby its energy spectrum evolves. The velocity distribution of FEBs will change as the background magneto-plasma parameters vary. In our model, electrons are accelerated in the advancing shock front. Some of the energetic electrons leave the acceleration region and they will have a beam velocity distribution when they leave. FEBs propagate downward along the magnetic loop, the electron beams will change via the energy lose and magnetic mirror effect. Solar radio burst is closely associated with solar flares, the study of solar radio emissions will help us understand the source and evolution of active region, storage and release of magnetic energy, particle acceleration and propagation, etc. 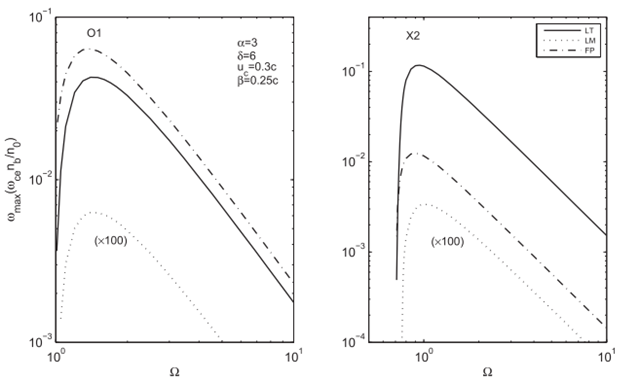 We found that the FEBs with different conditions and evolution process can excite cyclotron maser instability and produce different radio burst events. And we will develop the maser emission model of evolutionary electron beams, and apply it to the solar radio bursts study, such as moving type IV burst. It is significant and has important theoretical value to explore and establish the mechanism and physical model of flare. 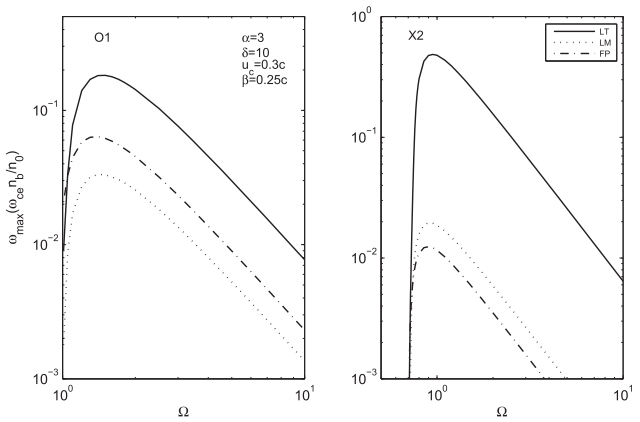 Maximum growth rates of O1 and X2 modes as a function of the plasma parameter Ω. The deepness index δ = 6. The growth rates of LM source have been enlarged by a factor of 100.